With a variety of guestrooms and suites, we have a style for everyone and everything to make your stay with us unforgettable. 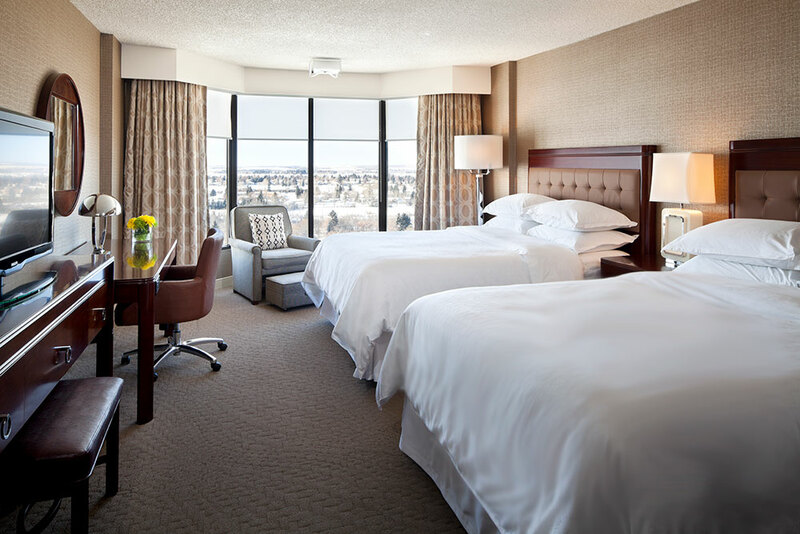 Choose an east facing room for beautiful prairie sunrises and sweeping views of the city, or stay on the west side of our tower and watch breathtaking sunsets beyond the Rocky Mountains. Our patio-side rooms are conveniently located next to our indoor pool and seasonal outdoor courtyard. 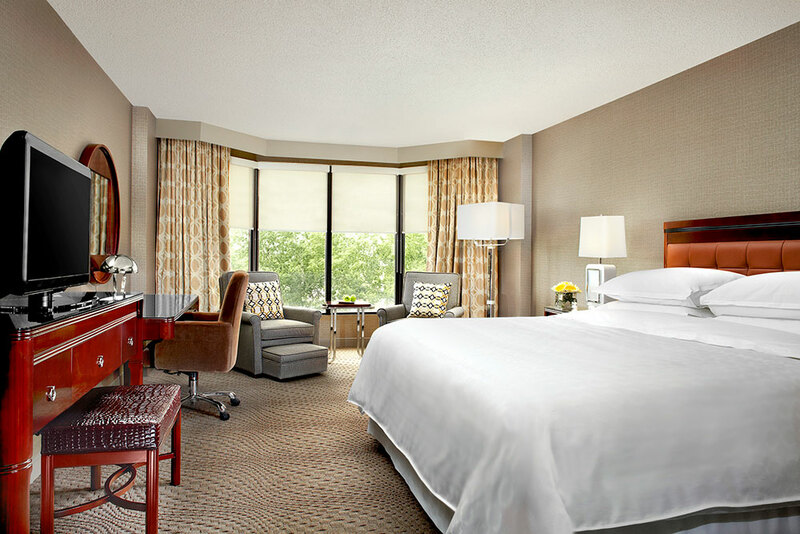 Every room comes with a variety of complimentary amenities to meet all your needs. Stay in this 240 sq. 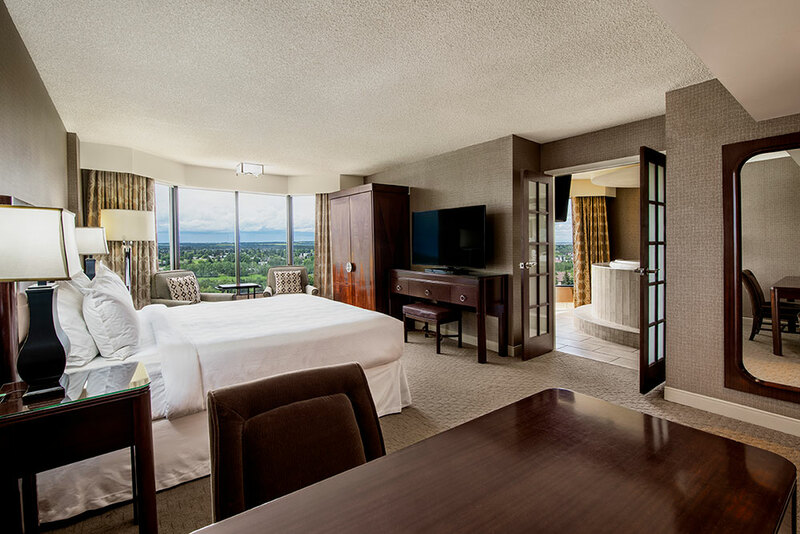 ft. bedroom and enjoy plush white linens on a King Bed, a 42” flat-screen TV, and complimentary amenities. 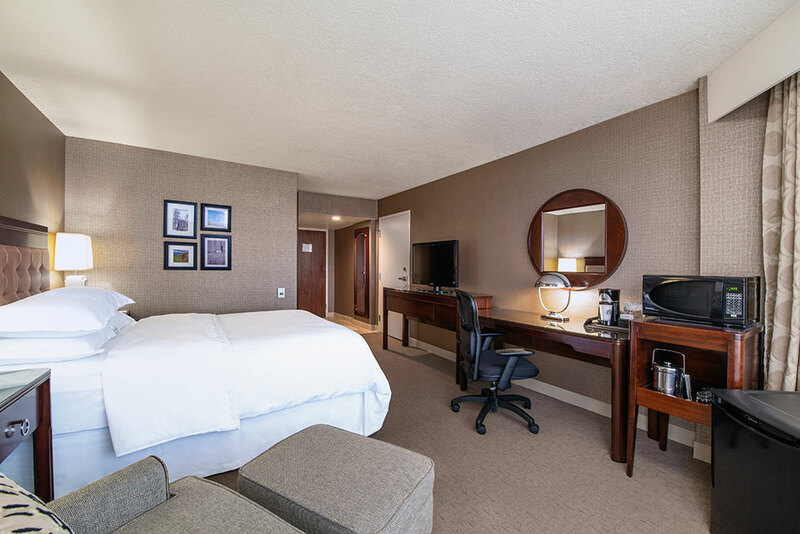 Stay in a deluxe 327-sq.-ft. room and enjoy one King Bed or two Queen Beds, contemporary furnishings, a 42” flat-screen TV, complimentary amenities and in-room safe. Take your stay to the next level! When you choose to stay on our Club Level Floor, you’ll fall in love with the perks! 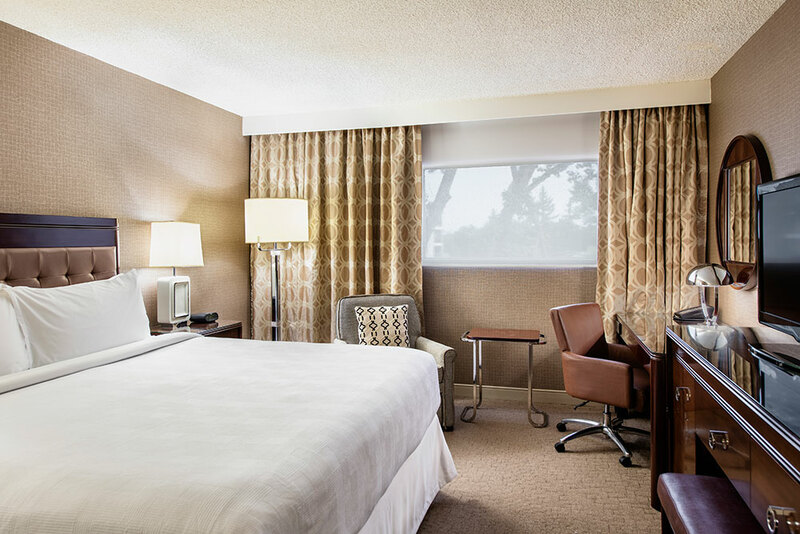 Enjoy one King Bed or two Queen Beds in a deluxe 327-sq.-ft. room and exclusive access to the comfortable and convenient Club Lounge, with benefits plus! Need a little extra space? All eight one-bedroom suites are 490-sq.-ft. and include an intimate living room with sofa, contemporary style furnishings, as well as a kitchen area with fridge and microwave. The separate bedroom features a King Bed with luxurious duvet and plush pillows and additional TV. Ready for a truly luxurious experience? 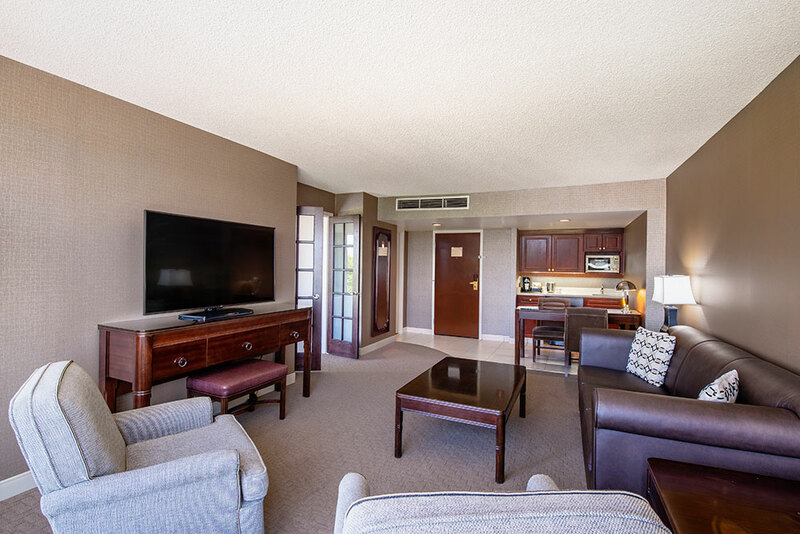 Soak up the view in one of our two posh 490-sq.-ft. Jacuzzi suites. 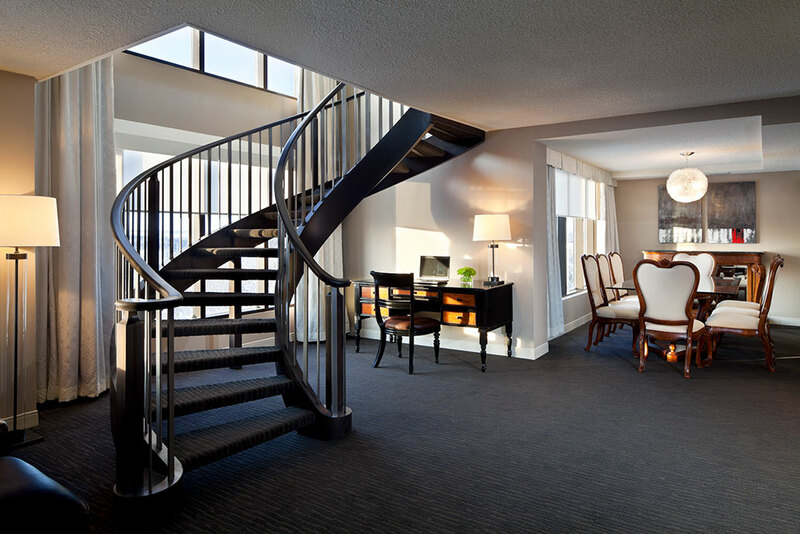 Perched on the top floors of Cambridge Red Deer Hotel, these suites feature a separate room with huge circular Jacuzzi tub and a spacious bedroom. Suites also include kitchen area with fridge and microwave, for added convenience. These two-level 981-sq.-ft. suites are open-concept with floor-to-ceiling windows spanning the length of the room. 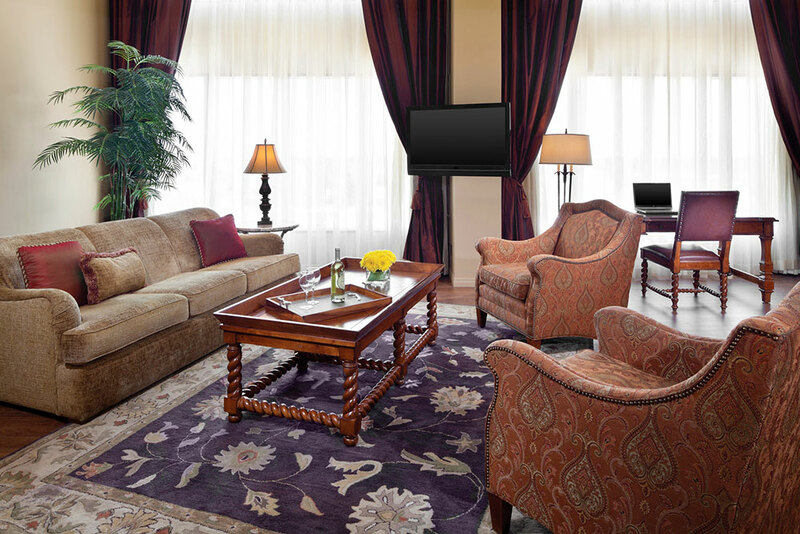 They include a relaxed living room, stand-up bar and 55" high definition flat-screen television. On the upper level, enjoy a loft area with king-size bed. Pamper yourself in the stunning spa-inspired bathroom with a two-person Jacuzzi tub, granite counters, a seated vanity area and an oversized slate tiled shower. This two-level 1,308-sq.-ft. suite features a relaxed living room, stand-up bar and 55" LG LCD high definition flat-screen television. On the upper level, enjoy two separate bedrooms. Pamper yourself in the stunning spa-inspired bathroom with a two-person Jacuzzi tub, granite counters, a seated vanity area and an oversized slate tiled shower. This spacious, 1,635-sq.-ft. two-level suite features a grand entrance with double doors, hardwood and carpeted flooring, accented by plush area rugs and contemporary furnishings. The main floor has a spacious living room with an acacia hardwood and glass 8-person dining table, floor-to-ceiling windows, powder room and fireplace. A curved staircase leads you to a loft-style bedroom. A secluded hideaway, this bedroom area features a king-size bed with a pillow top mattress, luxurious duvet and a mountain of plush pillows. Adjacent to the bedroom, the bathroom is a private oasis, accented by a large raised two-person Jacuzzi tub with a spectacular mountain view, quartz counters, and slate tiled shower. Stay in this spacious 327 sq. ft. accessible room with plush white linens on a Queen bed, accessible roll-in shower, extra wide bathroom doorway, 42” flat-screen TV, complimentary amenities and in-room safe. Adjoining companion rooms available.